Gone are the days where homemade bread was a regular daily activity. Now the only regular bread activity in my household is to stop at the store and buy a store loaf bread, that is pre-cut into slices for me, convenience is at my fingertips. I am new to the whole BBC Lifestyle shows and well the bug bit me and now that is the only channel I am watching. I just love Mary Berry and Paul Hollywood on The British Bake off masterclass. This past week I watched the bread masterclass and I couldn’t stop writing down recipe after recipe, because Paul made bread making look so easy. I am not that confident enough to make a baguette especially the part of creating steam in the oven. 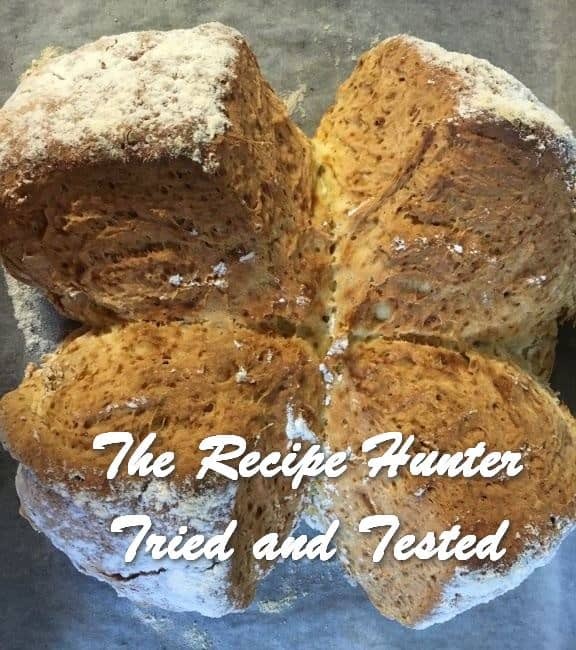 But what I was dying to try was the soda bread, it didn’t even require any yeast and no resting time for the dough to rise. I bite my nails and send out silent prayers hoping the bread will rise correctly, but not with this loaf. The cut with the sharp bread knife in the end just added a beautiful touch and the easy recipe made me look like a pro baker. I of course tweaked the recipe to meet the contents of my pantry cupboard. Extra flour for dusting over the bread. In a large bowl, mix the flour, bicarbonate of soda and salt together. Add the buttermilk and using your hands, mix the dough till it comes together nicely. Gently pour out onto a floured surface and bring the dough together to form a ball. Do not knead. Using a sharp bread knife cut the dough from side to side. Dust the top with some flour. Put the pieces next to each other, very closely, on a greased baking tray. Pop into a pre-heated oven and bake at 180C for 20 – 30 minutes on until the tops are nice and brown and crispy to the touch.